Our Holiday Cran Apple Chardonnay is a low alcohol white wine, featuring tart green apples balanced out by smooth white cranberries to create an easy drinking wine with a crisp, refreshing finish. Enjoy sipping this delightful vintage at holiday gatherings, perfect as a hostess gift or for sharing with special friends and family during the holidays. Available for a limited time only. Restricted Quantity. Fresh and zesty lime notes are perfectly balanced with the subtle flavour of coconut and citrus.Limited release. 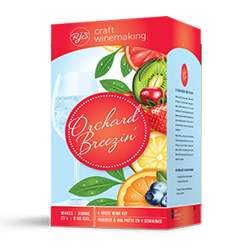 Our limited release Orchard Breezin’ White Sangria features lively flavours of juicy peach, ripe apricot and orange for a fresh, easy drinking wine with a smooth finish. Perfectly timed for the summer season, and ready to drink in just 4 weeks! Pairs well with zesty fish tacos and mango salsa, lemon garlic shrimp skewers or a grilled peach, basil and feta salad tart.